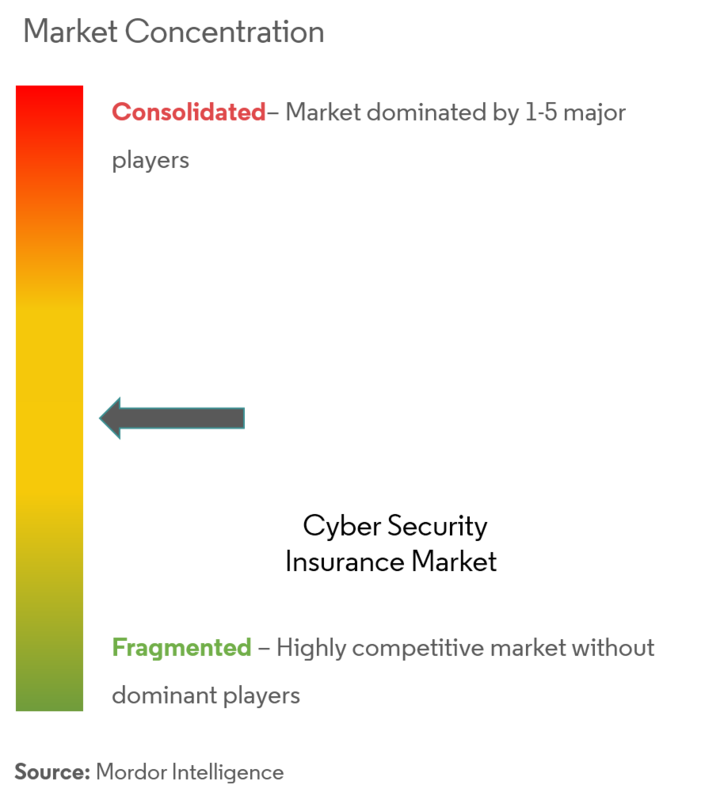 The market is segmented by Size of Organization (Small Medium Enterprises (SMEs) and Large Enterprises), End-user Industry (Healthcare, Retail, BFSI), and Region. The cyber security insurance market was valued at USD 5.48 billion in 2018, and is expected to reach USD 20.72 billion by 2024, registering a CAGR of 24.30%, during the forecast period (2019-2024). The trending digitalization, such as the cloud, Big Data, mobile technologies, IoT, and artificial intelligence (AI), in ever more areas of business and society, and the growing connectivity of everything, have increased the workload of already strained IT teams. Cases of unauthorized stealing or accessing sensitive business data, like intellectual properties, employees’ personal information, or even financial records, have been rising, which, in turn, is driving the cyber security insurance market. Cloud computing is one of the most rapidly growing recent technologies, eliminating the traditional boundaries of IT, creating new markets, spurring the mobility trend, enabling advances in unified communications, which is another driver for the cyber security insurance market. According to Kaspersky Lab, in the foreseeable future, around 75% of companies are expected to move applications to the cloud. This rising adoption of cloud solutions, by companies operating all over the world, often faces a lack of attention to the levels of security offered by adopted solutions. Also, cloud applications are more prone to cyber risks. Cyber security insurance is a contract that an individual or entity can purchase to help reduce the financial risks associated with doing business online. In exchange for a monthly or quarterly fee, the insurance policy transfers some of the risks to the insurer. Many companies purchase cyber security insurance policies to cover extra expenditures that could result from the physical destruction or theft of digital assets. Such expenditures typically include the cost of notifying customers that a security breach has incurred, as well as the cost of regulatory compliance fines. To qualify for coverage, the individual or entity typically has to submit to a security audit by the insurance company or provide documentation with the assistance of an approved assessment tool, such as that offered by the Federal Financial Institutions Examination Council. Many cyber security insurance policies only cover first-party losses to a company. Some policies, however, may also cover third-party liability losses. Due to data proliferation, healthcare is emerging as a significant market for the global cyber security insurance market. Digitization has exponentially increased the volume and speed of healthcare data generation. As much as 80% of the data generated by the healthcare industry is likely to be in the cloud by 2020. Security is also becoming a major concern. According to the HIPAA report, 2018 witnessed a 157.67% year-over-year surge in the number of exposed healthcare records in the United States. Accenture’s 2018 Healthcare Workforce Survey on cyber security found that almost 18% of healthcare employees were willing to sell confidential data to unauthorized parties, for as little as USD 500 to USD 1,000. This has increased the need for internal cyber security as an immediate solution. In one Telehealth survey, 69% of the patients expressed that they prefer getting medical care without visiting the hospital. The telemedicine market is expected to grow at a healthy rate, since more insurance companies are now offering coverage for these visits as well. 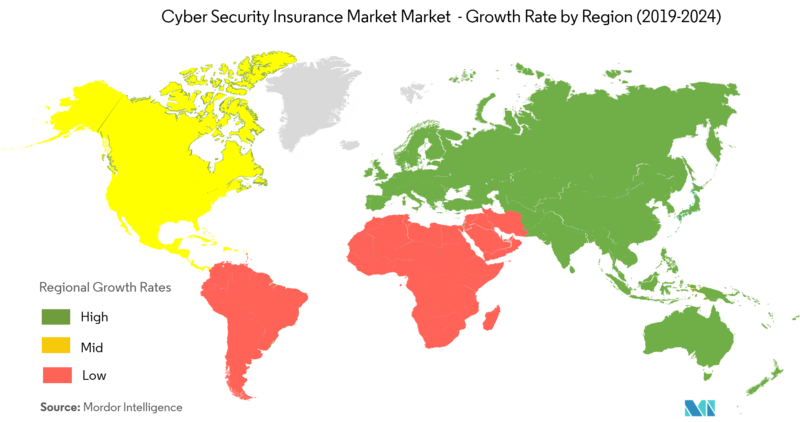 The United States is the largest market for cyber security insurance. 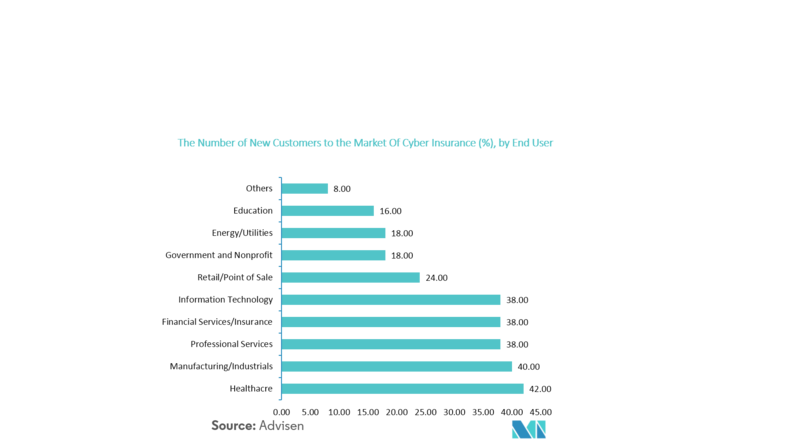 Moreover, the country has a strong foothold of cyber security insurance vendors, which adds to the growth of the market. 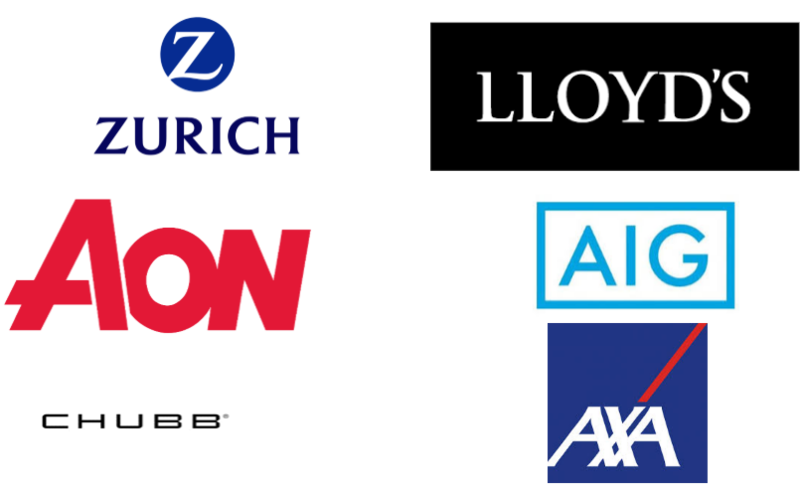 Some of them include XL Group Ltd, American International Group Inc., Berkshire Hathaway Inc., Security Scorecard, and Lockton Companies Inc., among others. The growth in the number of data breaches is pushing many organizations to take cyber security insurance policies. For instance, Equifax, one of the largest credit agencies in the country, in 2017, suffered a breach that affected approximately 143 million consumers. JPMorgan also witnessed one of the biggest bank breaches in history, as hackers got access to the financial information of 3,500 customers. According to the Identity Theft Resource Center, in 2016, around 1,093 data breaches were recorded in the United States, with 36.6 million records exposed. On the other hand, approximately 1,579 data breaches were reported in 2017, with at least 178.96 million total records exposed, thereby, indicating an exponential increase in breaches. 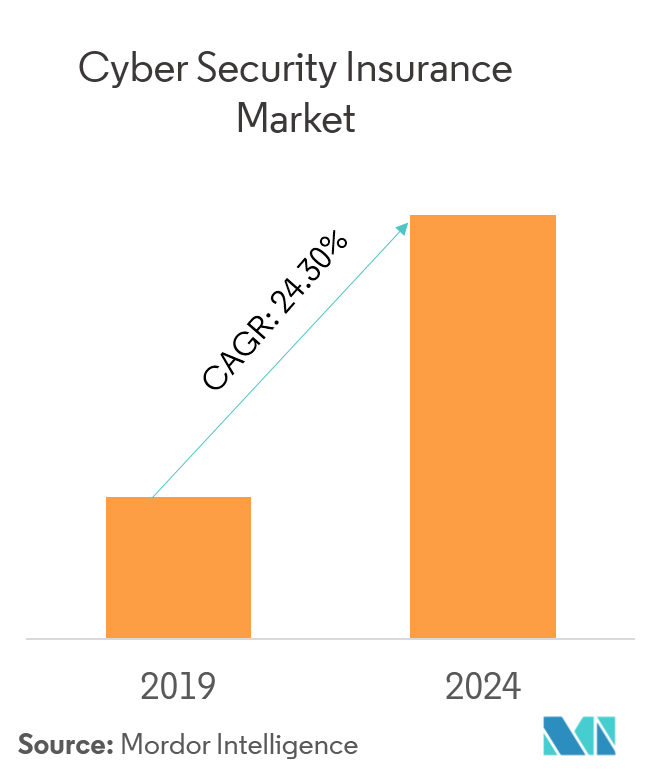 The cyber security insurance market is fragmented, with major players offering superior technology and fostering their growth through their existing distribution channels. These technology leaders are investing in innovation, mergers and acquisitions, and partnership activities, to maintain a competitive edge in the market. For instance, RedSeal and XL Catlin, in March 2018, announced a dynamic approach to cyber insurance, which uses an objective measurement of a network’s resilience to help underwriters more thoroughly evaluate their clients’ risks over time. This allows clients to continue to improve their cyber security and potentially improve their insurance terms. Chubb entered into a strategic partnership with PICC Property and Causality Company of China. The agreement leverages Chubb’s global capabilities in support of PICC’s customers and other Chinese affiliated companies around the world. Aon PLC and Hewlett-Packard Co. are collaborating to provide enhanced, integrated cyber coverage tailored to meet the rising needs of the middle market. The solution is expected to extend from a portal-based risk assessment by Aon through the deployment of devices, software, and services from HP, if it becomes necessary for post-incident response and recovery services from Aon. 7.1.2 American International Group Inc.